as tight as the dress is to be worn. from the large joint where neck and body join, down to the waist. Care must be taken to get this measure. is taken from the center of back to wrist joint,with arm raised and elbow bent. 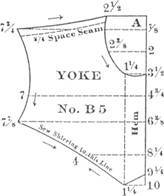 a garment look carefully at the drafts being copied; use numbers and curves as shown in draft. 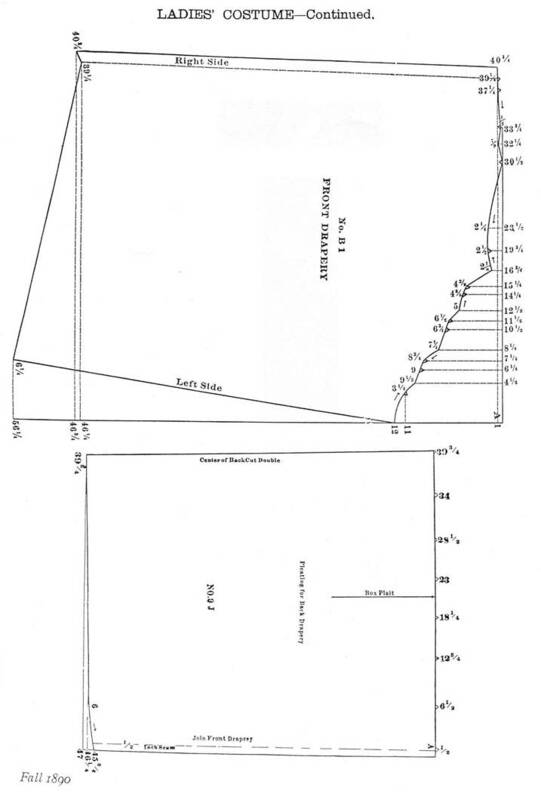 are used for two purposes— one to show which way to turn the curve, the other the number of points to be connected with the curve. should always be turned with the largest part in the direction in which the arrow points. When the arrow is placed betweentwo lines it shows that only two points are to be connected. When the arrow is placed upon a cross lineit shows that three points must be connected with the curve, that the point by the arrow is the middle one, and the points nearest on each side must be con­nected with the curve at the same time with larger part of the curve turned in the direction the arrow points. The letter A in corner of draft is the starting point in making draft. first : - Smooth, even tracing is very necessary. Place the pattern smooth on lining crosswise. Trace each line carefully. Cut out the lining same as pattern. Place the lining straight on the goods, the nap, if any, running down. Pin the lining at the waist line. Full the lining (from ¼ to ½ inches) each side of the waist line, from 1½inches below the waist line to 2½ inches above, the greatest fullness coming at the waist line; this shortens the lining, but when boned it will be stretched to place. Leave the lining easy each way, from top of darts to shoulders, and one-fourth of an inch full at center of shoulder line. Never backstitch in basting or draw the thread tight. In joining the different parts together, care must be taken, as smooth, even basting is necessary. Pass the needle exactly through the traced seam lines on both sides of the seam, as many garments are ruined by careless basting. In joining the back and side-back, hold the side-back to you, thus you will baste one up and the other down. It is a good idea to pin these pieces before basting. If the shoulder blades are prominent, hold the back piece a little full where the shoulder blades strike to within 1½inches of arms-eye. In basting the shoulders, hold the back to you. Baste evenly for one inch, then stretch the front shoulder to match the back, for the Lack is always cut longer. 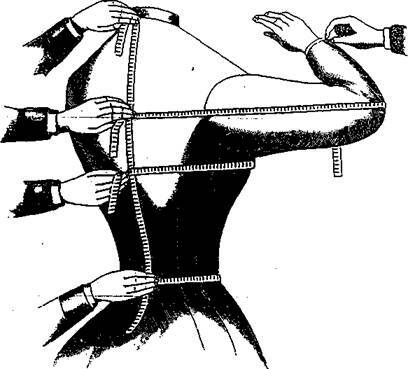 Use the scale corresponding with bustmeasure to draft the waist and sleeves which consists of Front, Back, Side Back Under Arm-Gore, Yoke, Shirring, Collar, Puff for the Sleeves and two Sleeve Por­tions. Gather the portions for the full front at the top and sew to the yoke. Lay the pleats at the bottom according to the notches; join to the under front at the under arm and shoulder seams; close in front with hooks and eyes. The back is plain, but may be made with a yoke same as the front, if de­sired; finish the bottom with a band of ribbon or velvet, two or three' inches finish in the back with loops and long ends of the same, gather the top the puff and sew in with the sleeve; gather the bottom and finish with a band of velvet or ribbon; finish the sleeve at the hand with one or more bands of the same width. 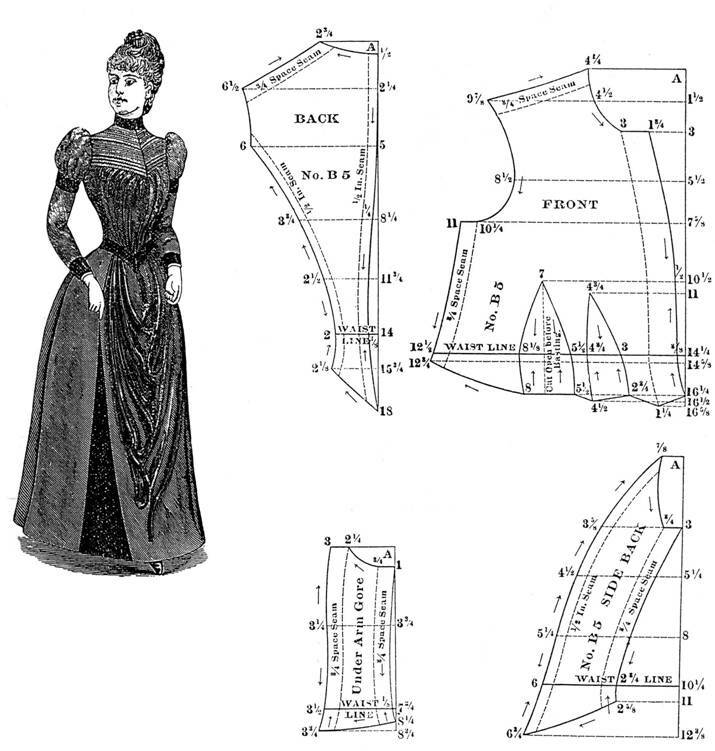 Ihe drapery is drafted by the scale corresponding with the waist measure it consists of three pieces - Front, Side Panel and Back Drapery. Lay the pleats according to the notches; the back is laid in two triple box-pleats; make it as long as the skirt. 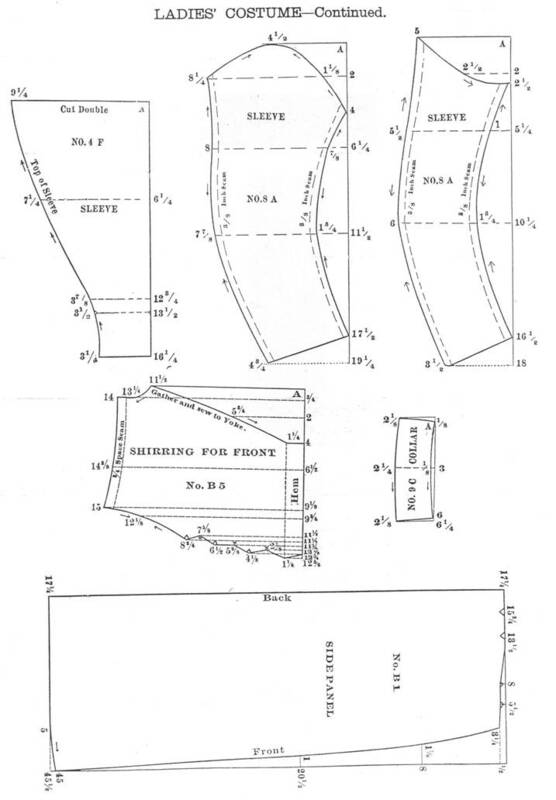 The diagrams for the skirt are given on page 5, it is drafted by the scale corresponding with the waist measure, is in three pieces—Front, Back and Regulate the length by the tape measure.